A Russian Proton rocket launches the Express AM5 communications satellite into orbit on Dec. 27, 2013 from Baikonur Cosmodrome in Kazakhstan. A Proton rocket fired away from the snow-covered Baikonur Cosmodrome in Kazakhstan on Thursday, completing a series of maneuvers before deploying a Russian civil communications satellite in orbit nine hours later. Liftoff of the workhorse Russian rocket from the Central Asia launch base was at 1049:56 GMT (5:49:56 a.m. EST; 4:49:56 p.m. local time). The 19-story rocket quickly disappeared into a soupy cloud deck hanging over the Baikonur Cosmodrome, where temperatures hovered near freezing and a coating of snow blanketed the arid terrain. The three-stage Proton rocket hurled the Express AM5 communications satellite and a Breeze M upper stage on a ballistic trajectory just shy of the velocity required to attain a stable orbit around Earth. Ten minutes after liftoff, the Breeze M separated from the Proton's third stage, according to the Russian Federal Space Agency. Moments later, the Breeze M began an initial engine firing to reach a low-altitude parking orbit. 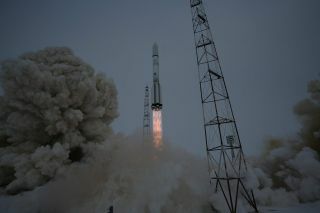 The Express AM5 spacecraft is owned Russian Satellite Communications Co., the country's state civil satellite operator. The Express AM5 communications satellite is seen here before its launch atop a Russian Proton rocket from Baikonur Cosmodrome, Kazakhstan, on Dec. 27, 2013. With a launch mass of 3.4 metric tons, or about 7,500 pounds, Express AM5 was manufactured by an industrial consortium led by ISS Reshetnev, a Russian satellite contractor. Express AM5 was the first satellite built around the heavy-class Express 2000 platform, according to ISS Reshetnev's website. Canada's MDA Corp. built the satellite's repeater and antennas. Russia's Radio Research and Development Institute, known by the acronym NIIR, designed and manufactured the craft's communications payload, according to Reshetnev. The satellite is designed for a 15-year lifetime and will be positioned in geostationary orbit at 140 degrees east longitude, covering Russia's Far East, Southeast Asia and Australia. Such an orbit allows the spacecraft to remain in a fixed location in the sky for users on the ground. Express AM5 carries 40 Ku-band, 30 C-band, 12 Ka-band and two L-band transponders, according to RSCC. The satellite will provide digital television and radio broadcasting, telephone, video conferencing, data transmission and Internet services. Like other satellites owned by RSCC, Express AM5 will also be used for mobile communications among between the Russian president and other government leaders, the company says on its website. Follow Stephen Clark on Twitter: @StephenClark1. Copyright 2013 SpaceflightNow.com, all rights reserved.